When aboard the Death Star if you were to look into the locker of any given Stormtrooper you'll find an official robe given out by the Empire. The reason why the robe matches the Stormtrooper armor is because every soldier needs always be ready in case the rebels show up. A little known fact is that the accuracy of a Stormtrooper's aim improves when in the robe. So now you can join the Empire while being comfy in this great Star Wars robe. 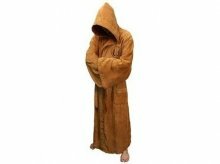 The Jedi Dressing Gown is made of soft 100% cotton velour and has a Jedi logo embroidered on the front. The bath robe's large hood, sash belt and wide sleeves are classic features of a Jedi robe. Will you be seduced by the dark side or will you fight for justice is up to you.